The Belfast Agreement, alternatively and widely known as the Good Friday Agreement, and occasionally as the Stormont Agreement, was a major political development in the Northern Ireland peace process. The issue was to restore devolved government to Northern Ireland and to end the sectarian violence and conflict between republicans (mainly Roman Catholic) who want union with the Republic of Ireland to re-unite the whole island of Ireland, and loyalists (mainly Protestant) who want to remain within the United Kingdom. It was signed in Belfast on April 10, 1998 (Good Friday) by the British and Irish governments and endorsed by most Northern Ireland political parties. Former US Senator George Mitchell played a leading mediating role during the multi-party talks, which he chaired, starting on June 10, 1996. On May 23, 1998 the Agreement was endorsed by the voters of Northern Ireland in a referendum. On the same day, voters in Ireland voted separately to change their constitution in line with the Agreement. The Democratic Unionist Party (DUP) was the only large party that opposed the Agreement until after the St. Andrews Agreement (October 13, 2006). Former British Prime Minister John Major had laid some of the groundwork for the Agreement when he issued the 1993 Joint Downing Street Declaration with the Irish Taoiseach, Albert Reynolds and by helping to bring about the 1994 ceasefire. This enabled Gerry Adams and other leading members of Sinn Féin to join the process. Although the largest of the republican parties, Sinn Féin had been previously excluded because of links with paramilitary organizations. As many of those who had earlier supported violence switched to diplomacy, the prospect of a peaceful solution increased. Decommissioning of the paramilitaries was central to the agreement. Violence has not completely disappeared but a fragile peace has been established. Key to this is that the causes of the divide between the two communities are being addressed while power is shared between both communities, drawing more and more people into the political process. Also key was Ireland's willingness to compromise regarding its territorial claim to the North, and the UK's willingness to concede that the Irish people as a whole had the right to solve the North-South issue by mutual consent. As a result of the Belfast Agreement, former enemies are now cooperating and working together, even with those whom they previously denounced and demonized, due to assurances and mechanisms ensuring social justice written into the Agreement. The Belfast Agreement built on and was a development of a peace process dating back to at least the Sunningdale Agreement of December 1973, which attempted to restore devolved government to the United Kingdom province of Northern Ireland with power-sharing built into the system. The Northern Irish Parliament, established after the island of Ireland had been partitioned in 1921 was prorogued in March 1972 and effectively wound-up because the governing party, the Ulster Unionist Party, could not halt the civil violence or solve the issues that generated the civil disobedience. From then until the creation of the new Assembly following the Belfast Agreement, Northern Ireland was ruled from Britain by the United Kingdom government. The Troubles are usually said to have started in October 1968 when a Civil Rights a march in Derry resulted in violence between the demonstrators and the Royal Ulster Constabulary. By August 1969 riots were taking place across NI. The Civil Rights movement consciously modeled itself on the USA's, which combined direct action, civil disobedience and non-violence. Future Nobel Peace Prize winner and a major contributor to the peace process, including the Belfast Agreement, John Hume was one of the leaders of the Civil Rights movement. The movement was mainly republican and Catholic but had some Protestant support. It demanded an end to the systemic and systematic discrimination against Catholics that dated from the creation of the province of Northern Ireland. Discrimination against Catholics also took place over the many centuries of British rule in Ireland, predating partition. For much of this history, Catholics could not vote or stand for public office while restrictions were placed on land ownership as well as on employment. A series of rebellions against British rule took place. It was after the 1641 rebellion that land was confiscated from Catholics and Protestants were settled to pacify the island and to spread what the British saw as the true form of the Christian faith. Most settlers were from Scotland, who settled in the North. As momentum in Ireland for independence from Britain picked up and as successive British governments tried to rid themselves of the "Irish problem," a nationalist movement developed. The Irish Rebellion of 1916 was the latest in the long series. Throughout the nineteenth century, Britain wanted to grant Ireland "Home Rule" within the British Empire but by the early twentieth century most Irish wanted a separate, sovereign state. This was opposed by the Unionists in the North, many of whom feared incorporation into a Catholic-majority state. They would, they said, be persecuted; Protestants in Ireland, after all, had persecuted Catholics for centuries. As plans for granting Home Rule to the whole island developed, the Protestants in the North declared their willingness to fight to prevent the destruction of their Protestant constitution, by which they meant the United Kingdom. Following World War I, Britain was anxious to finally resolve the "Irish problem" and proceeded with the Government of Ireland Act. By 1920, partition of the North from the South was embraced as a compromise designed to avoid violence. It did not succeed in achieving this aim because a civil war began in the South against Home Rule in favor of a fully independent state, which was achieved with the creation of the Republic of Ireland. Partition was not intended to be permanent but to all intent and purpose it created a Protestant dominated state in the North, with its own devolved government (except for defense and foreign affairs). This state set about systemic discrimination against Catholics in employment (hardly any Catholics were employed in the police, in local defense and security organizations or in the civil service), and housing, while gerrymandering ensured lack of political power. Many Protestants saw NI as their "promised land," gifted them by God to take away from the God-less people who lived there, who thus had no rights to the land. An IRA mural depicting the Hunger Strikes. Murals were used by both sides to mark out their territory; a type of apartheid system kept the communities physically apart, with education also segregated. By the 1960s, after decades of discrimination, a Civil Rights' movement was underway demanding social justice and reform of the political system. Meanwhile, however, both communities also had para-military organizations dating back respectively to the republicans' involvement in the Irish Civil War (many Catholics in the North never abandoned the goal of union with the South, so were called "republicans") and to Unionist preparations to resist Home Rule. Before long, peaceful demonstrations degenerated into violence and both sides began to engage in acts of terrorism especially after the event known as Bloody Sunday (1972). What began as a movement for civil rights within the Northern Irish state became for many involved a struggle to achieve political re-unification with the South. As violence escalated, British troops were stationed in the province and devolved government was suspended. Trial by judge without jury was introduced and republican detainees or those convicted were denied the status of political prisoners, leading to the hunger strikes during which, famously, Bobby Sands (1954-1981), who had been elected to the British Parliament as Sinn Féin member for Fermanagh and South Tyrone, died after a 66-day long hunger-strike. The Sunningdale Agreement was the first initiative aimed at restoring devolved government. It failed when the Unionists withdrew their support. Civil conflict and violence continued. Sinn Féin, linked to the Irish Republican Army, had MPs at Westminster but did not occupy its seats and was excluded from any peace negotiations. The republican cause was represented by people such as John Hume of the smaller Social Democratic and Labour Party, who, however, kept in close contact with the Sinn Féin leadership. As more people became convinced that neither side could win through violence, a peace movement developed led by Betty Williams and Máiread Corrigan, who held the first ‘people-movement’ peace rally, a protest by relatives of victims and those who feared becoming victims in October 1976. The following year, the two women leaders were awarded the Nobel Peace Prize, the first of several people to receive this honor as a result of involvement in the Northern Ireland peace process. Although it was not until November 1985 that the next major political initiative since Sunningdale took place, the Anglo-Irish Agreement, the women's contribution to creating the conditions that made this possible is widely acknowledged. The was the result of years of behind-the scenes meetings and negotiation especially involving John Hume, who is generally credited with the thinking behind Sunningdale, this Agreement and the subsequent Good Friday Agreement. British PM Margaret Thatcher and Garret FitzGerald, Ireland's Taoiseach, signed the Anglo-Irish Agreement. However, Ian Paisley leader of the Democratic Unionist Party (a break away from the Ulster Unionists, whom they consider too willing to compromise) and UUP leader, James Molyneaux, then led a protest rally, shouting 'No Surrender' and 'Ulster Says No'. In protest, all Unionists MPs resigned and in the following by-election, the DUP and the UUP agreed not to stand against each other and were returned to their Westminster seats with increased majorities. The next major development was the 1993 Downing Street Declaration of 1993 signed by British PM John Major and the Irish Taoiseach (prime minister), Albert Reynolds. The Declaration affirmed that NI would only cease to be part of the UK if a majority of its population expressed a desire to leave, which led to a change of Articles 2 and 3 of the Constitution of the Republic of Ireland to affirm that while the unity of the island remained 'the firm wish of the Irish nation', it would only be achieved when a majority in 'both jurisdictions in the island' expressed this wish. Ireland thus recognized Northern Ireland's legality as an entity within the United Kingdom. Sinn Féin could enter negotiations if it renounced violence. The following year, the IRA announced a cease-fire, after which the first ever official talks between the British government and Sinn Féin's President, Gerry Adams, took place. Some former members of the IRA, disgusted by their own inhumane acts, were beginning to renounce violence and to support the diplomatic process. Responding to the ideas of the women's movement, public opinion began to shift away from violence; the paramilitaries on both sides may never have enjoyed the support of a majority of their communities but they did have a high level of approval. In 1995, former US Senate majority leader George Mitchell was appointed to draw up principles of non-violence which all parties involved in the peace-process would have to accept as a condition of participating. He was then asked to chair multi-party talks on the restoration of devolved government. It was these talks, which took place in Stormont Castle, built to house the former NI Parliament where the new Assembly would later sit, that produced the Belfast Agreement. One former IRA operative has written about how increasingly "the most reasonable and compromising voices" for peace have often been former paramilitaries disgusted by their own actions. "The main thing we can reasonable hope for," he wrote, "is that the various groups will agree to differ without the use of violence." This former operative writes that he had openly criticized Gerry Adams for "selling out" what he called "physical-force republicans," until he realized many years later that "the armed struggle was taking nationalists nowhere" and that Adams "deserves respect for … slowly taking the republican movement with him towards a future without violence.". The writer was himself murdered as a traitor to the cause outside his own home on January 27, 1999. The multi-party talks were chaired by Mitchell, with Canadian General John-De-Chastelain, later chair of the International Commission on Decommissioning, assisting him. While the DUP under Ian Paisley excluded itself, all other political parties were involved including several with small memberships in an effort to include as many opinion leaders as possible. Representing the political parties of Northern Ireland were: John Alderdice of the Alliance Party (later a Liberal Peer); Monica McWilliams of the Women's coalition (later NI Human Rights Commissioner); David Ervine of the Progressive Unionists; Gerry Adams of Sinn Féin; Gary Mitchell of the Ulster Democratic Party; Malachi Curran of the Labour Party of NI and David Trimble of the UUP, co-winner with John Hume of the 1998 Nobel Peace Prize. Other principals involved in the talks or in behind-the-scenes power breaking are included below. Key to the talks was how to ensure that the social justice issues would be addressed by the new devolved government and that neither community would privilege itself over the other. The complete renunciation of violence was also considered to be crucial. The DUP in part excluded itself because it did not consider Sinn Féin to be sincere in rejecting violence and considered its leaders to be themselves guilty of acts of terror. On the other hand, inclusion of Sinn Féin as the republican party with the largest share of votes was vital for the success of the talks. Yet when in subsequent elections, the DUP replaced the UUP as the most popular Unionist Party, it became crucial to include the DUP as well. This led to the subsequent St. Andrews Agreement enshrining additional assurances that convinced Ian Paisley not only to endorse the power-sharing agreement but to accept the post of First Minister. John Hume of the SDLP. Awarded the 1998 Nobel Prize for his role. David Trimble of the UUP. Co-winner of the 1998 Nobel Peace Prize for his role. Gerry Adams of Sinn Féin. From 1988 (until the ban was lifted by John Major in 1994) Adam's voice was banned from being broadcast in the UK. Adam's ability to talk to the paramilitaries on one side and to politicians on the other was key to the success of the talks. Former US Senator George Mitchell chaired the multi-party talks and acted as a power-breaker. He later served as Chancellor of Queen's University, Belfast. Former British PM, Tony Blair played a leading role during the negotiations. Former Irish Taoiseach (Prime Minister) Bertie Ahern also played a leading role. Awarded honorary doctorate in 2008 by Queen's University, Belfast for his contribution together with Tony Blair by the University's Chancellor, George Mitchell. Ian Paisley, leader of the Democratic Unionist Party was conspicuous by his absence from the process. He initially opposed the Agreement but joined the process following the St. Andrew's Agreement (October 13, 2006) which resolved some remaining issues, then served as First Minister from May 8, 2007 until June 5, 2008, when he retired. US President William Jefferson Clinton is recognized as having played a key role. He was not present during the talks but was in close contact with many who were. In 1994 he issued Gerry Adams a visa to visit the United States. Visiting Northern Ireland in 1995, he met Adams, famously shaking his hand. In 1996, he appointed Mitchell as US Special Envoy. In September 1998 he again visited Northern Ireland helping to promote the Agreement. Stormont Castle, Belfast where the multi-party talks were held. establishment of a British-Irish Inter-governmental Conference (replacing the former Anglo-Irish Inter-governmental Conference, established by the Anglo-Irish Agreement), which gave a consultative role to Ireland concerning matters not devolved. conditional early release within two years of paramilitary prisoners belonging to organizations observing a ceasefire. establishment of the Northern Ireland Human Rights Commission. repeal of the Government of Ireland Act 1920 by the British Parliament. normalization of security measures, e.g., closure of redundant army bases. confirmation that the right to hold both British and Irish citizenship is accepted by both Governments and would not be affected by any future change in the status of Northern Ireland. The Agreement also marked the end of a dispute between the two states over the names of their respective states: the United Kingdom of Great Britain and Northern Ireland and Ireland. Vague wording of some of the provisions (described as "constructive ambiguity"), which helped ensure acceptance of the agreement at the time, served to postpone debate on some of the more contentious issues—most notably paramilitary decommissioning, police reform and normalization. A date of May 2000 was set for total disarming of all paramilitary groups. This was not achieved and delayed the establishment of the Assembly and Executive, because one of the four main parties in the Assembly—Sinn Féin—was "inextricably linked" to the largest paramilitary group, the Provisional Irish Republican Army (PIRA), and unionists refused to share power with this party, while the PIRA remained armed. In May 1998, there were separate referenda concerning the Belfast Agreement The referendum in Northern Ireland was a direct vote on the Agreement while the vote in Ireland was a vote to amend the Irish constitution in line with the Belfast Agreement. The result of these referenda was a large majority in both parts of the island of Ireland in favor of the Agreement. In the Republic only 85,748 (3 percent of the electorate) voted 'No' but approximately 40 percent of the electorate did not exercise their franchise. In the North, when normal combined voting strengths among both nationalist and unionist communities are superimposed on the Referendum result, it is clear that pre-polling opinion polls and exit polls on the day were correct in showing that a majority of the unionist voters voted 'Yes'. The DUP claim to have been at that point 'a majority of the majority' was clearly difficult to substantiate although in later events they succeeded in so becoming. The Assembly and Executive were eventually established in December 1999 on the understanding that decommissioning would begin immediately, but were suspended within two months due to lack of progress, before being re-established in May 2000 as Provisional IRA decommissioning eventually began. 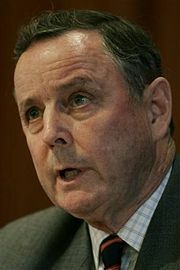 Trimble became First Minister on July 1, 1998. He resigned in July 2001 but was re-elected in September. Aside from the decommissioning issue, however, ongoing paramilitary activity (albeit relatively low level compared to the past) by the Provisional Irish Republican Army—e.g., arms importations, smuggling, organized crime, "punishment beatings," intelligence-gathering and rioting—was also a stumbling block. The loyalist paramilitaries also continued similar activity although as they were not represented by a significant political party, their position was less central to political change. Canadian General John-De-Chastelain assisted Mitchell at the talks then chaired the International Commission on Decommissioning from 1997 submitting his report September 25 2005 that the Irish Republican Army has decommissioned the totality of its weapons. He was created a Companion of Honour in 1999, a year after John Major had received the same distinction for his contribution to the Irish peace process. The overall result of these problems was to damage confidence among unionists in the Agreement, which was exploited by the anti-Agreement DUP which eventually defeated the pro-Agreement Ulster Unionist Party (UUP) in the 2003 Assembly election. The UUP had already resigned from the power-sharing Executive in 2002 following arrests of Sinn Féin personnel on charges of gathering intelligence for use by terrorists. (These charges were eventually dropped in 2005 on the controversial grounds that pursual would not be "in the public interest." Immediately afterwards, one of the accused Provisional Sinn Féin members, Denis Donaldson was exposed as a British agent.) In October, 2002 the Assembly and Executive and First Ministership were suspended. In 2004, negotiations were held between the two governments, the DUP, and Sinn Féin on an agreement to re-establish the institutions. These talks failed, but a document published by the governments detailing changes to the Belfast Agreement became known as the 'Comprehensive Agreement'. On 26 September 2005, however, it was announced that the Provisional Irish Republican Army had completely decommissioned its arsenal of weapons and "put them beyond use." Nonetheless, many unionists, most notably the DUP, remained skeptical and agreement on how to restore the power-sharing assembly still had not been reached as of July 2006. Of the loyalist paramilitaries, only the Loyalist Volunteer Force (LVF) had decommissioned any weapons under the oversight of the International Commission on Decommissioning, chaired by General John de Chastelain. Talks were held at St Andrews in Scotland between October 11 and 13 in which Adams and Paisley participated. One of the main aims was to resolve issues that prevented the DUP from joining a power-sharing administration. This included assurances that Sinn Féin would recognize the new police service for Northern Ireland. Agreement was reached and on May 8 2007, a Power Sharing Executive was again established to govern Northern Ireland in devolved matters. The second Northern Ireland Executive consisted of the DUP and Sinn Féin, with the Rev. Dr. Ian Paisley of the DUP as First Minister and Martin McGuiness of Sinn Féin as Deputy First Minister. Although Dr. Paisley was the head of the government, he and Martin McGuiness held equal powers within the Northern Ireland Assembly government. George W. Bush with Ian Paisley and Martin McGuiness in the White House December 8, 2007, following the St. Andrews Agreement after which Paisley and McGuiness became First Minister and Deputy First Minister of Northern Ireland respectively. Dr Paisley, getting on in years, retired from the office of First Minister and from the leadership of the DUP on 5 June 2008 and was succeeded in both functions by Peter Robinson. In the third Northern Ireland Executive the same political relationship now exists between Mr. Robinson and Mr. McGuinness as existed formerly between Dr Paisley and Mr. McGuinness. Visiting George W. Bush in Washington, DC with the First Minister, Paisley, McGuiness is reported to have said that before they began to work together they had never had a conversation about anything, not even the weather, but now they got on well and had never exchanged a single angry word. Paisley also developed a positive relationship with the Irish PM, Bertie Ahern. The Belfast Agreement represents a major peace initiative, part of a long process involving successive British and Irish governments and politicians from Northern Ireland, as well as private individuals such as the leaders of the women's movement. Several lessons can be learned from this process. First, that renunciation of violence is a necessary condition for political stability and full participation in the diplomatic process. Second, the need to include as many actors as possible which involves finding ways to bring former enemies and people who demonize each other together around the table. A similar process of inclusion has been part of the Israel- Palestine peace process that saw the famous 1993 hand-shake between fellow Nobel Peace Prize winners, Yasser Arafat and Yitzhak Rabin. Third, the role of an outside mediator, in this instance, George Mitchell, or in the case of Israel and Palestine, the government of Norway, also proved critical. Fourth, perseverance was vital, despite set-backs and the lengthy period of time over which no progress was made. Fifth, a shift in public opinion towards peace and away from violence suggests that when a majority of people want peace, their political leaders will deliver it. Finally, any enduring peace deal must address the causes of civil unrest. Acceptance of the peace deal by republicans does not mean that they have abandoned their goal of union with the South but that this will be achieved, if and when it is achieved, through use of the ballot box when a majority in the North express their wish for re-unification with the South and this is accepted by a majority of the citizens of the Republic of Ireland. Demographics may resolve the future of North-South relations in Ireland as the Catholic population in the North increases while the Protestant population declines. ↑ This was set out in the Downing Street Declaration. ↑ Since the Northern Ireland parties were distinct and separate from the main UK parties, this meant that nobody from NI was directly involved in its governance. ↑ Eamon Collins, with Mick McGovern. 1997. Killing Rage. (London, UK: Granta. ISBN 9781862070080), 6-7. ↑ Johnny Caldwell, 2008. Good Friday Negotiators. BBC News. Retrieved August 9, 2008. ↑ The 1998 Power brokers. BBC News, March 19, 2008. Retrieved August 9, 2008. ↑ These issues included acceptance of the new police service for Northern Ireland by Sinn Féin and the DUP agreeing to the power-sharing arrangement. ↑ 2000. Clinton: His role in Northern Ireland. BBC News. Retrieved August 2, 2008. ↑ System devised by Victor D'Hondt, a Belgian mathematician. ↑ Government of Ireland and Government of the United Kingdom. 1985. Article 2, Anglo-Irish Treaty CAIN (Conflict Archive on the Internet). Retrieved August 9, 2008. ↑ David Andrews, 1999, Address by Mr. David Andrews, Irish Minister for Foreign Affairs at the Exchange of Notifications ceremony at Iveagh House, Dublin, 2 December 1999. CAIN (Conflict Archive on the Internet). Retrieved August 9, 2008. ↑ The Treaty of Amsterdam was an amendment to the treaty creating the European Union. Signed on October 2, 1997, it introduced a number of significant changes made substantial including greater stress on individual rights, enhanced powers for the European Parliament thus strengthening democracy and what has been described as the beginning of a common EU foreign and security although not defense policy, among other developments. ↑ 1998. Paramilitary Arms Destroyed.. BBC News. Retrieved August 9, 2008. ↑ Martina Purdy, 2007. "Charming Ministers" woo President. BBC News. Retrieved August 9, 2008. Aughey, Arthur. 2005. The politics of Northern Ireland: beyond the Belfast Agreement. London, UK: Routledge. ISBN 9780415327879. Collins, Eamon with Mick McGovern. 1997. Killing Rage. London, UK: Granta. ISBN 9781862070080. Moran, Jon. 2008. Policing the Peace In Northern Ireland Politics, Crime and Security After the Belfast Agreement. Manchester, UK: Manchester Univ Press. ISBN 9780719074714. Morgan, Austen. 2000. The Belfast Agreement: a practical legal analysis. London, UK: Belfast Press. ISBN 9780953928705. Wilford, Rick. 2001. Aspects of the Belfast Agreement. Oxford, UK: Oxford University Press. ISBN 9780199242627. Wilford, Rick, and Robin Wilson. 2006. The trouble with Northern Ireland: the Belfast Agreement and democratic governance. TASC at New Island pamphlet series, 3. Dublin, IE: New Island. ISBN 9781905494279. North-South Ministerial Council/An Chomhairle Aireachta Thuaidh/Theas. Address given at the Exchange of Notifications ceremony, whereby Ireland dropped its territorial claim to Northern Ireland, Iveagh House, Dublin, 2 December 1999. This page was last modified on 26 May 2016, at 15:09.